As of June 30, 2015, the Rensselaer Campus Computer Store, a non-profit computer store formerly operated by Rensselaer's Division of the Chief Information Officer (DotCIO), has relocated and is now part of the Rensselaer Collegiate Store on the first floor of the Rensselaer Union. 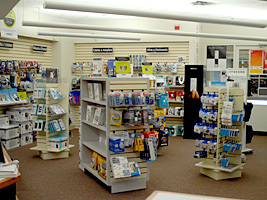 The computer section of the store offers pre-sales consulting to Rensselaer students, staff, and faculty to help them determine their present and future computing needs, and aims to sell the right equipment to meet those needs. The store also obtains hardware and software by establishing educational agreements with manufacturers, and these contracts enable the store to bring products to the Rensselaer community at competitive prices.